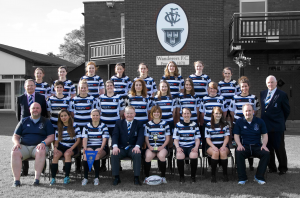 Women’s Rugby – Wanderers F.C. Hear what the team have to say! Follow our match updates and news here! The Wanderers women’s team was founded in late 2014. Over the 2014/15 season we worked on developing a squad and entered the Paul Cusack Cup at the end of the season, where we won the Paul Flood Plate. It was the first ever women’s trophy for the club! In the following 2015/16 season Wanderers women were ready to enter the league. In our first ever league season we topped the table of Division 4 but unfortunately lost the final. We came back stronger in 2016/17 and won the Division 4 Leinster League in March 2017, and got promoted to Division 3! Women’s rugby is a dynamic and skillful sport combining athleticism and strength. The game caters for all shapes and sizes and we are always looking for new recruits young and old. Contact us today via social media or contact Anne or Dave (above). We look forward to seeing you on the pitch!